Following her duties as one of Florence Nightingale's proteges during the Crimean War, Lib Wright finds herself stuck in the monotonous duties of being a civilian nurse. With the excitement and urgency of the war behind her, Lib longs to find some kind of purpose in her work. When an opportunity in Ireland presents itself, Lib jumps at the chance to do something different. Little does she know that the job will bring about the most personally and professionally challenging situations in her life. Lib finds herself in the home of the O'Donnell family, a simple dwelling that hosts the mother, father, and daughter whose devotion to each other is only surpassed by their faithful adherence to their religion. Even after the untimely death of their only son, the family remains resolute in their adoration. This devotion reached a miraculous peak when their eleven-year-old daughter Anna started to abstain from all food. For months, young Anna has captured the imagination and curiosity of the faithful and scientific communities by surviving solely on "manna from heaven". A committee of local medical professionals, businessmen, and clergymen have hired Lib and a subdued nun to keep watch of the girl. They will monitor Anna and her family to either verify to disprove her stunning claims. A strong believer in science and reason, Lib is determined to expose the O'Donnells and frauds. But how can Anna, a child who seems unwavering in her convictions, be the mastermind of such a complex deceit? Fans of Emma Donoghue's Room may be a bit surprised by the restraint that permeates The Wonder. When I discussed this novel with my book club, most members found the pacing to be unbearably slow. The Wonder is not a fast read. Most of the novel centers around Lib keeping watch over Anna in the confines of the child's bedroom. Unlike Room, the novel is driven not by action, but by the developments and revelations of the characters. For her part, Donoghue allows the mystery of the situation to bubble beneath the surface of the entire book. Each character interaction inches closer to an ending that is both satisfying and astonishing in it's revelation. In The Wonder Donoghue weaves a quietly provocative tale of morality and spirituality that is clever as it is revealing. 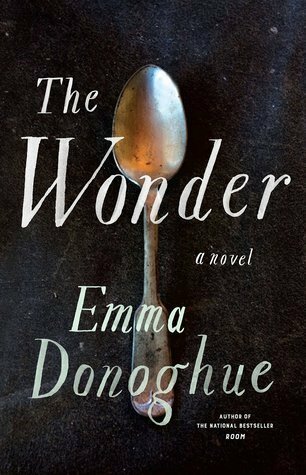 This entry was posted on Saturday, December 31, 2016 and is filed under Book Review,Emma Donoghue,Fiction,Ireland,Religion,Room,The Wonder. You can follow any responses to this entry through the RSS 2.0. You can leave a response. It sounds like this one is very different from her other, more popular novel. I'm not sure how well I would be able to work with the slow pace, but I am glad that did not deter you from the enjoyment and the message in this story at all. I think the slow pace is actually deliberate. It really allows for the development of the characters that would be absent if the pace was too quick.